Some people assuming caring about your home decor isn't "manly," but we beg to differ. Think about the ultimate man's man - Clint Eastwood. Do you really believe he's satisfied seeing to his routine hygiene in a bland bathroom with no personality? We think not. With that in mind, here are some ideas for guys who'd like to make their bathroom one of the most macho parts of their house - and potentially impress visitors with their rugged yet stylish sensibility toward bathroom decor. While the most obvious thing you could do to make your bathroom as manly as it could be is build it all yourself - along with the rest of the house - preferably out of wood you chopped down in fierce, tundra wilderness. However, that's not terribly realistic. Some more down to earth advice appears on Decor Interiorsus. Simplification is emphasized by the expert site. Just because you're the type of guy who likes the idea of having a fashionable bathroom vanity doesn't mean you have to make it obvious. "Attractive" and "subtle" are the words Decor Interiorsus uses to describe the ideal manly bathroom, and that seems like a sound direction to shoot for. While you might want to consider keeping the decor utilitarian yet mildly memorable, a few black and white photographs or other unassuming bits of art could be stashed around your bathroom, according to the source. Don't forget to keep you vanity organized, either. Some people think being messy is manly, but we know better. If you're wondering where to find a visual cue for what constitutes a manly bathroom, take a gander over a Roomzaar.com. The first entry on its compilation of manly bathrooms is a case-and-point instance of a vanity for a man's man - it contains a simple grey- and white-spotted marble counter, square mirror with a black frame, and some inspiring words placed on the adjacent wall. "Be strong when you are weak, brave when you are scared and humble when you are victorious." Doubtlessly, any bathroom user who reads those words will be pumped up for whatever manly activities their day holds. 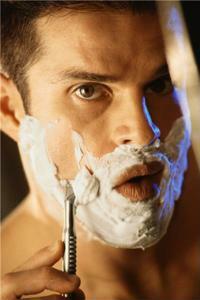 Speaking of manliness - let's not forget about shaving. The Man Institute notes that shaving with a straight razor may be the most manly method of removing those daily whiskers - the site explains that every time you use a straight razor, it's a "near-death experience." While that's only half-true, a straight razor could definitely provide a clean shave.